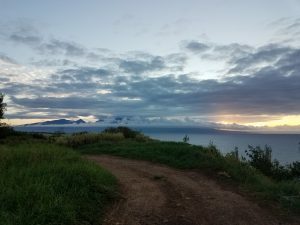 We had to wake up early today for our trip to Hana. 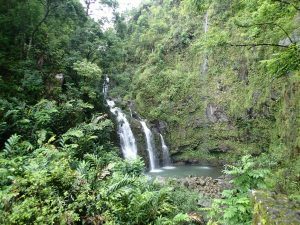 The Road to Hana is a famous drive in Maui with many attractions along the way. The road is known for it’s natural beauty all around, including waterfalls,cliff sides, and views of the Pacific. 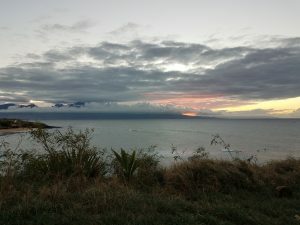 There are many guides online about how to do the road to Hana and I used a variety of sites to help plan our day. We only had a day, which was unfortunate, but we did see and do a lot! After having our leftovers from Da Kitchen for breakfast we left Kihei around 7:30. 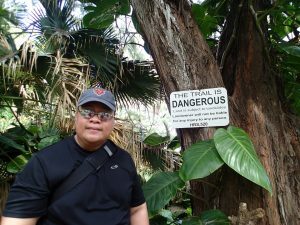 The plan was for me to drive the way to Hana and for Don to drive back. We first stopped in the town of Paia. It was a cute, small town. It seemed a bit hippy-ish. We didn’t really spend any time here, just made a bathroom stop and we were on our way. The drive was pretty cool. It was a bit scary at times, but awesome. 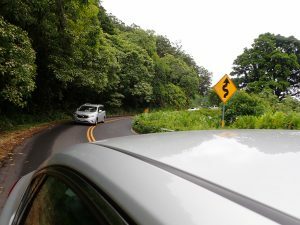 The road was filled with areas that were only one way and hairpin curves. At times it would be rainy and then a minute later the sun was out. There were often lots of cars and people also. Our first stop was Twin Falls. 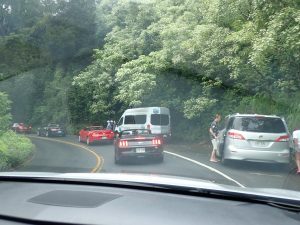 There is a small parking lot at Twin Falls but a lot of people will end up pulling over on the side of the road like we did. The hike down to Twin Falls was not long but it was slippery. 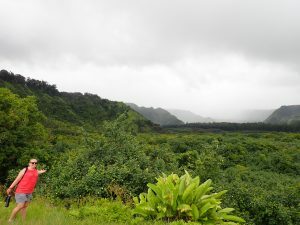 The next place I wanted to stop was a lookout point in a Wailua Valley. We thought we had missed it but then we saw a small parking area. The walk up to the lookout was not long and it was easy. The views were incredible. 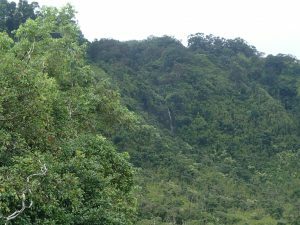 We could see a waterfall in the distance. 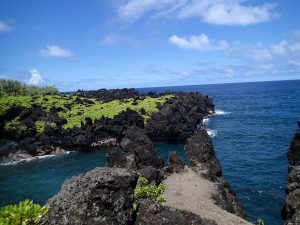 This is what I always envisioned Maui being. 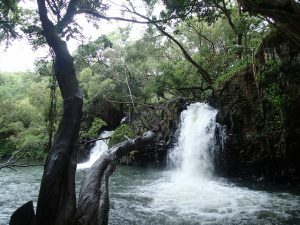 Waikani Falls was the next place we stopped. You can see this waterfall just by pulling over on the side of the road. There are many signs saying not to pull over, but many people were so we did. It was pretty awesome. 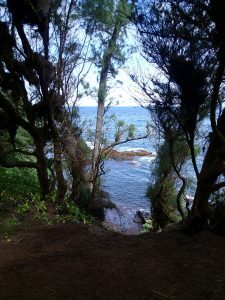 The highlight of the road to Hana was the Waianapanapa State Park. We got here and walked around a bit. Then we decided to have our lunch before we did much more here. We brought lunches we had picked up at the grocery store the night before. We had sandwiches, chips, salad, and even a couple of Longboards. We ate in the car because they were no tables nearby. Once we were done eating we changed into some swimwear because we knew there would be a beach. 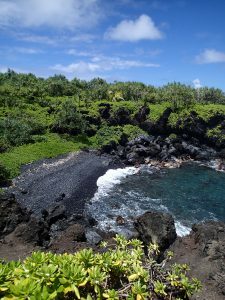 The beach was formed by volcanic rock so the sand was actually black rock. 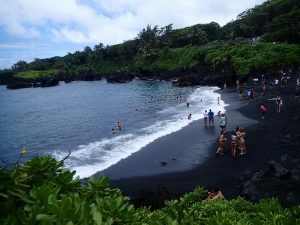 It was called Black Sand Beach. It was very hot walking down to the beach, but it was overcast. We got into the water and it was cold but refreshing. It started to rain a bit. Supposedly, you should be able to swim out to caves in the rock but it was too rough to do this today. Once we were done swimming we got out and continued our hike. 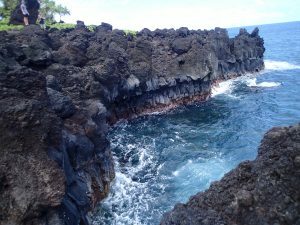 There were really cool lava rock formations. The sun started to come out and it was so hot. We walked around for about 30-45 minutes, but I felt like I was going to get burnt and it was so hot so we turned around. There were just incredible views on this hike. The water at the beach looked calmer now that it was sunny and a few people were pretty far out snorkeling. We made our way back to the car and Don started driving. 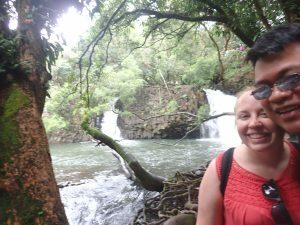 We drove to the town of Hana. From the park it wasn’t far, maybe another 20 minutes. We didn’t really know what to do in Hana so we found a place to park where we thought there was a beach. We started walking towards the water and it was pretty much a walk straight down a cliff. Don ended up falling and luckily he didn’t get hurt. I didn’t want to continue because it was so slippery and the water below was so choppy with rocks everywhere. It was beautiful but I didn’t want one of us to get hurt. This was taken 2 minutes before Don slipped. We made our way back to the car and decided to drive back to Kihei. Don had a lot of fun driving. He felt like he was in a racing game. I started feeling sick because I often get car sick. We stopped at a shop and got some coffee and chocolate chip banana bread. The bread was so good! 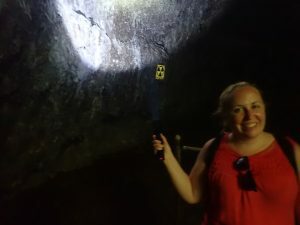 We also found the Hana Lava Tube Cave and even though it was set to close soon the guide let us and a few other people explore the cave. 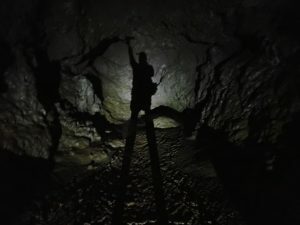 It was a pretty cool cave and it was a self-guided tour. 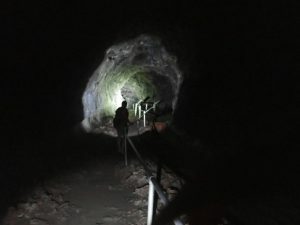 It took about 30 minutes and it was a little spooky at times, especially when you turned off your flashlight. On the way back we wanted to stop at this restaurant area so we did but things were closing down and nothing looked that good. It seemed like a tourist trap. I did get an iced coffee and some cokes for the ride. I was able to take some Dramamine and I felt pretty good on the ride back. We stopped at a lookout point that had incredible views of the sun starting to make its way down. There was a bench here with the name Sierra on it. We made another stop by some cows. Our last stop on the way back was a beach lookout. 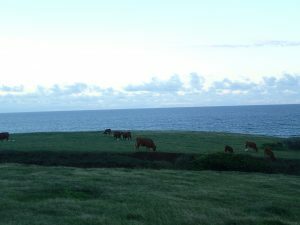 The beach was called Ho’okipa. The views of the sunset were awesome. Don noticed some people gathering on the sand down on the beach. They were looking at something. 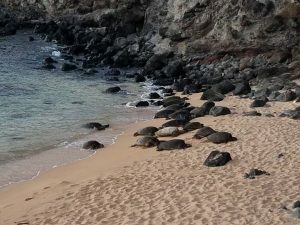 It looked like rocks on the sand but then Don realized they were sea turtles! The sun was starting to set fast but we wanted a closer look so we drove the car down to the beach and found a spot. The turtles were so awesome! 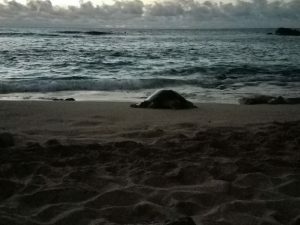 They come up here almost every night to rest on the beach. A conservationist was there to keep people from getting too close. She told us sometimes there are over 150 turtles here a night. We stayed here until the beach was closing. Every day in Maui so far we have seen turtles!! By the time we got back to Kihei we were both pretty hungry and the pizza place I wanted to try had already closed at 8. So we found a bbq place called Daddy’s Smokehouse and it was pretty good. It was a long but pretty awesome day. Previous PostMaking Our Way To KiheiNext PostLast Day–More Snorkeling!